If you didn't submit or I didn't find your seed GROW project link(s) for March, please drop the link in a comment in that post. April, is the 'official' start of the seed GROW project. Make sure to publish your post about how you're sowing them this coming Sunday. Please add your link, or Email it to me, or send me a tweet or put it on the GardenBloggers Facebook page and I'll add them to the link list. The Garden of Live Flowers: April: Seed GROW project. Terra Mirabilis: Growing nasturtiums with the GROW project. Garden Girl: Seed GROW Project. The Garden of James: Renee's Garden Nasturtiums. Cheesehead Gardening: Experimenting with my seed GROW project seeds. Mahlzeit: In which we welcome the god and goddess. Dotty Plants Journal: Nasturtiums from the GROW project. 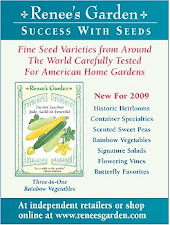 In the Garden Online: Seed GROW project April. Get in the Garden: Seed GROW project. The Running Garlic: Nasturtium GROW project. MrBrownThumb: From Miss C.H. Lippincott to Renee's Garden. Garden Faerie: Hippy Hoppity, Nasties on the Way. The Home Garden: Starting Nasturtiums for the Grow project. Indoor Garden(er): Seed GROW Project, For-Real #1. The Write Gardener: Starting Easter Sunday. Our Little Acre: Decisions, Decisions. The 6X8 Garden: Seed Grow Project Nasturtium Spitfire. Gardening in my Rubber Boots: Germinating Nasturtium Seeds for GROW project. True Epicure: Seed GROW Project-April. K-Town Homestead: Now the green blade rises. Happy Hobby Habit: GROW Project 2. Life on the Balcony: Nasturtium Seed Scarification Experiment. Personal Garden Coach: Renee's Garden, 'Spitfire' Nasturtium & the GROW project. Brown Thumb Mama: Seed GROW project Milestone. Horticulture Madness: Seed GROW project: Spitfire Nasturtium. Jenn's Gardening Spot: Let's GROW together, That's the topic this Easter Sunday. Miller Time: Seed GROW Project: First Official Post. To soak or Not to Soak. Holy Germination, Batman. The Yarden: Trial by (Spit)Fire. My Skinny Garden: A New Way of Wintersowing. GardenMom: Seed Grow Project: Spitfire Nasturtium from Renee's Garden. Really Rose: Seed GROW Project April 2010. Evolution of a Gardener: Seed GROW project. My Northern Garden: Seed GROW: Spring is Early, I am Late. Does Everything Grow Better in My Neighbor's Yard: Seed Grow Project. UPDATE: It just dawned on me to create a hashtag on Twitter. So, I'll be using #seedGROW to promote posts. If you tweet your blog links use it and I'll RT your posts. Since I'm up and running, I posted yesterday. Check it out. My post is up. I planted early as hot weather will take them out here. Thanks Ladies, I've updated the post with your links. I'm a bit behind--I had my GROW post scheduled a few days ago, so I forgot to tweet and link here! Now, it is done. Off to look at others' posts! My post is also up! I can't wait to read them all. I'm here! A bit late due to the Easter festivities. It's too cold to plant mine indoors or out yet, but I still put up a little post about them. I'm here! Better late than never... http://www.gardenmom29.blogspot.com/ Seed Grow Project: Spitfire Nasturtium from Renee's Garden thanks...this is going to be so fun. oh , i could cry, i just found your site, just heard about your site, and now as always I'm a day late and a dollar short, or in this case, a month late and a seed short. Suppose it is way too late to get in on the action? Post dated post - http://really-rose.blogspot.com/2010/04/seed-grow-project-april-2010.html - stll a little too early in my northern Zone 8a to direct sow, but counting the days, well weeks . . . FYI...I have another post for April here.